The Old Foodie: Old Foodie Birthday Competition. The Old Foodie will be one year old on October 31st (her actual body has a rather larger-numbered birthday in December, and the actual blog has a birthday in March, but lets not get too complicated), and in celebration she invites you to enter a competition for which she will give a prize. 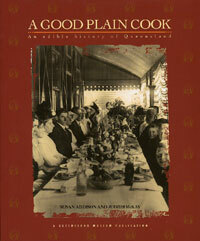 The prize is a copy of “A Good Plain Cook: An edible history of Queensland” by Susan Addison and Judith McKay, and published by the Queensland Museum. If you have ever wondered how to roast bandicoot or wallaby, or use dry coffee as a preservative, or make Poor Man’s Goose, then this is the book for you. If not, it also has recipes for Anzac biscuits, Miss Schauer’s Cup Cake, and pikelets and such like, which are sure to please. The book is delightfully illustrated with photographs, advertisements and images from by-gone days. There will be ten questions taken from Old Foodie stories. If you have been paying attention they will be easy to answer. The questions will be posted on Tuesday morning, October 31st at whatever time I get around to posting (usually quite early Australian Eastern Standard Time). In order not to penalise those of you around the globe who will be sleeping soundly at that time, it will not be “first correct answer wins”, it will be “first correct answer drawn out of my largest mixing bowl wins”. I will give until the end of the weekend, which I have determined to be midnight on Sunday the 5th November, Australian Eastern Standard Time. You can work it out, I know you can.